HOW NECESSARY IS THAT PESKY TERMS & CONDITIONS PAGE? Well, it’s not a legal requirement as in it isn’t mandatory. But you probably already knew that, and that’s why you’re reading this. Another question you’re probably asking yourself right now is, why doesn’t this website have its own terms and conditions?. The answer to that is that in our particular case we don’t need T&C’s on this site. In any case, it doesn’t mean that you shouldn’t have one or that it doesn’t serve any particular use. 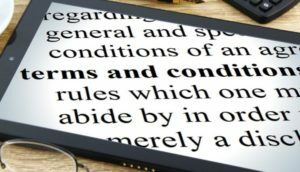 Your T&C’s set the rules on how your website ought to be used and, more importantly how it shouldn’t. It is more than a mere social contract as Courts will give effect to it if a user breaches your terms or infringes copyright or other intellectual property protection mechanisms, such as trademarks for example. ← CAN A WEBMASTER LEGALLY HOLD YOU TO RANSOM?